That’s the line, Sandra Bullock playing Debbie Ocean says when asked to hire a male member to her group for a heist. 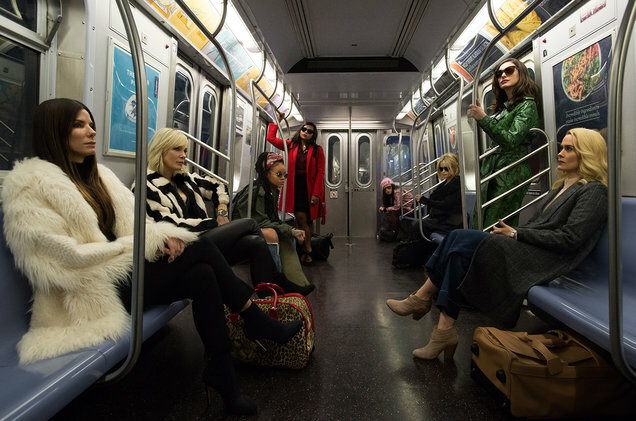 Ocean’s 8 like the predecessors in this multi star cast franchise, packs a punch. With great actors like Sandra Bullock, Cate Blanchett, Anna Hathaway, the film definitely has a stellar star cast. So much hotness on screen is definitely a plus point. In this movie like any other heist movie, the storyline is quite predictable and follows the same formula – establish the target (a rare and very expensive Cartier necklace) + formulate a plan (Debbie takes 5 years, 8 months and 12 days for this!) + gather a team (the amazing star cast) + execute the plan (Lo and Behold a fake MET Gala where you actually see celebrities like Anna Wintour, Heidi Klum, Serena Williams) – last minute twist/ trouble – resolve it – and voila, you’re multiple million dollar richer! Even with a predictable storyline, I enjoyed this film. The camaraderie shown between Sandra Bullock’s character Debbie Ocean and Cate Blanchette’s character Lou Miller is reminiscent of the one shared between George Clooney’s character Danny Ocean and Brad Pitt’s character Rusty Ryan but for me it’s more. I like how these two ladies know each other so well, how they’re there for each other. The performances delivered by this beautiful star cast is commendable, timely and relatable. The movie has great dialogues and punch lines. It has that typical Ocean family trait of stealing/ conning as well as the averseness for keeping any debts and of settling scores. Gary Ross’s direction is good. Though I wondered how they managed so many stars on ground. Especially with the global sensation like Rihanna. Even though the sensation isn’t that good an actor, she did well with her screen time. For a potter head such as moi, I was surprised to like Helena Bonham Carter’s character Rose Weil. She’s a brilliant performer. Overall the movie is exciting, involving and definitely worth watching. If nothing else, just go to see a good all-female ensemble and great fashion (I loved everything Debbie Ocean and Lou Miller wore) and for a fake MET Gala with some of the A-listers in view! Share your views in the comment section below! Happy watching! I’m definitely looking forward to Ocean’s 9, which has to be in the offing. Thanks! Have you seen the movie?